The Big Agnes Slater UL1 tent is a one person shelter which provides multiple features that the single backpacker will love having. First and foremost, it's all about the weight. The trail weight is an ultralight 2 pounds 4 ounces, and just the fast fly comes in at 1 pound 10 ounces. And yet still, it has a good amount of space inside. Campers up to 6 feet 6 inches have reported being able to sleep comfortably inside the Slater UL1 end to end with their pack fully inside and not crammed against the wall. Space like that is really a challenge to find for 1 person tents. The Slater delivers that and as a result is a really good tall person tent, one of the best around if you're committed enough to pay Big Agnes prices. 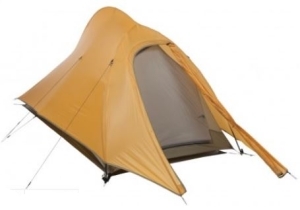 The Big Agnes Slater UL1 Tent is a lightweight and easy to manage single person tent. This tent provides an amazing amount of room to move around in. At 40 inches tall, a fully grown adult can sit up inside the tent. With the featherlite NSL pole system, hauling around the poles puts no additional stress on your back. Attached via the Big Agnes pole hubs, these three poles bend and provide a structure that the tent body can clip to from underneath. This same system allows the fly and footprint combo to be used as a freestanding structure. The upper walls are a thin, breathable nylon material. These is a small pocket of mesh by the footbox. The D shaped door has two zipper options. It can be closed with the nylon door, or partially opened to reveal additional mesh to keep you cool on balmy nights. The single vestibule provides 6 square feet of space to keep your gear outside. The rain fly door seals against the weather, but can be heavy with condensation in the morning. A Velcro strip prevents it from falling back down on you when you first unzip it. The rain fly likewise has a habit of brushing up against the mesh around the foot area at night, allowing some small amount of moisture in. 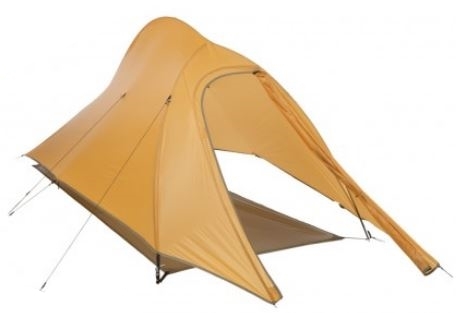 This tent is incredibly easy to pitch by yourself. The pole structure slips together, with the tent snapping to the poles in multiple places to create its shape. Since the poles only slide through the tent structure in three rather obvious places, the support pieces are not color coded. Once the 8 hooks are in place, the tent body is ready to use. With a trail weight of 2 pounds, 4 ounces, even taking the entire tent along is easy on the backpacker. The Big Agnes Slater UL1 Tent is arguably large enough for two small campers to share. With 47 inches of head room, you can enter this tent head first and easily swing around to get your feet into the 36 inch footbox. 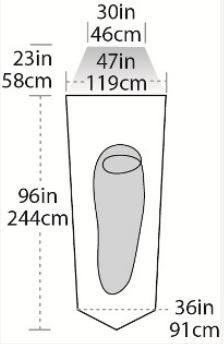 With 96 inches of length, even the tallest of campers can fit easily inside this tent. The added 6 feet of vestibule space provides plenty of room for your gear and boots outside. This tent’s nylon sides can be a hindrance and a help, depending on circumstances. Because the sides are nylon, they don’t breathe as well as mesh would. This causes some condensation issues on humid nights. Opening the tent door alleviates much of this problem, but does away with any privacy that the nylon walls create in the process. When the fly is in place and properly staked out, the tent has been proven to be sufficiently weather-tight. If foul weather is expected, this entire unit plus the optional footprint weighs in at only 2 pounds, 8.5 ounces for trail weight conditions. The poles will collapse to only 19 inches long, but the tent body itself rolls up small, making this the perfect unit to slide into a backpack. With a fast fly weight of 1 pound, 10 ounces, fair weather camping provides an even lighter backpacking experience. 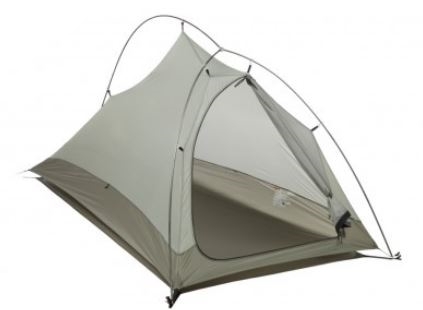 With a price tag ranging from $350-395, this tent can be a little out of the average backpacker’s price range. The footprint and gear loft are not included, demanding still further expense from the backpacker wishing a lighter or better organized camping experience. The tent is not lacking in value for the money (as in quality) just a bit expensive for some buyers. With multiple features to provide additional room in this tent, and a fly that creates a large vestibule, this lightweight design is perfect for backpackers. Although the loss of ventilation from the nylon sides can be a drawback at times, this tent will provide a warm and comfortable place for an average sized person on the trails. Packed Size 5" x 19"